The Knitter's Nicole Leybourne taught herself how to make sweaters by watching endless YouTube tutorials - she'd seen a fluffy yellow design in one of Perth's fashion boutiques and felt determined to make something even better. 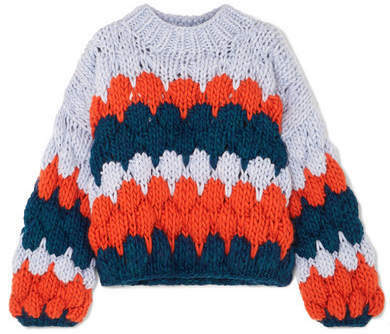 Handmade using sustainably sourced wool that's biodegradable and natural, this orange, navy and lilac style is spun with voluminous, rounded sleeves. The colors will really pop when you wear it with dark jeans.